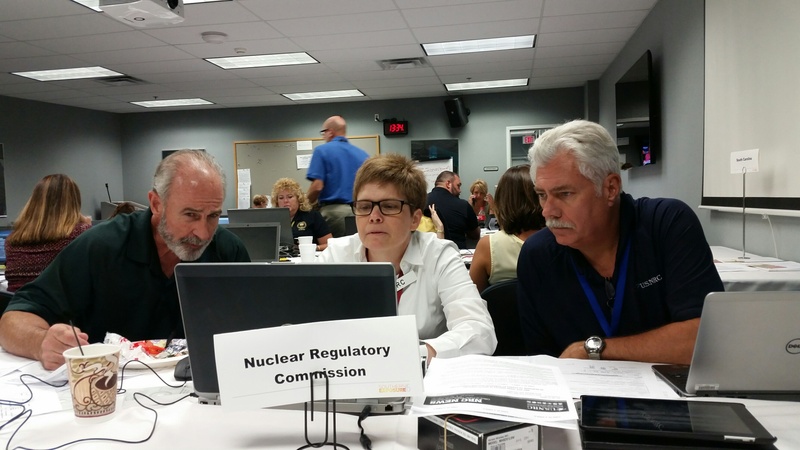 Public Affairs staffers Roger Hannah, Stephanie West and Joey Ledford work together in the Joint Information Center during the national level exercise dubbed Southern Exposure 2015. It included dozens of federal, state and local agencies working together under a scenario of a simulated nuclear power plant accident in South Carolina. For the full story, go here. So thanks for this post, it answered a lot of questions for us! I think it is good to feature PR folks responding to a simulated nuke emergency. For PR folks have dropped the ball so often in not only dealing with a real disaster but with just about every nuclear issue with which they are involved. Of course TMI was a disaster and the communications during the event were delayed, incorrect, and eroded public trust in the industry and the NRC. The 2011 Fukushima disaster left its mark on many Japanese. “There’s nobody that they trust any more for information”, said Dr Evelyn Bromet at the University of New York. The NRC communications to Americans on Fukushima were just as bad as they were during TMI. This after all the “improvements” in emergency communication plans since then. In his book, Fukushima, Dave Lochbaum details the confusion and mixed signals transmitted by NRC PR folks during the Japanese disaster. Hopefully this exercise demonstrates a marked improvement in those communications! How many “observers” from the public were present, I bet NONE.